Who isn’t talking about Tinder these days? Last night, I was helping several single ladies in their 20s decide on who to swipe right to and how to find someone who isn’t just looking to hook up. 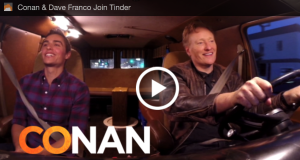 Meanwhile, at Team Coco, Conan O’Brien and Dave Franco decide to try their luck at Tinder on television. In a funny skit, they came up with fake screen names, but real photos to learn about the sizzling hot mobile dating trend of Tinder. Are you swiping right on Tinder? Have you met someone offline and are in a Tinder relationship? We’d like to hear your Tinder stories. Follow @JulieSpira for online dating advice and sign up for our free Weekly Flirt newsletter.